It's just right to hang on your shoulder. It is a back with beautiful stitches at the round bottom. 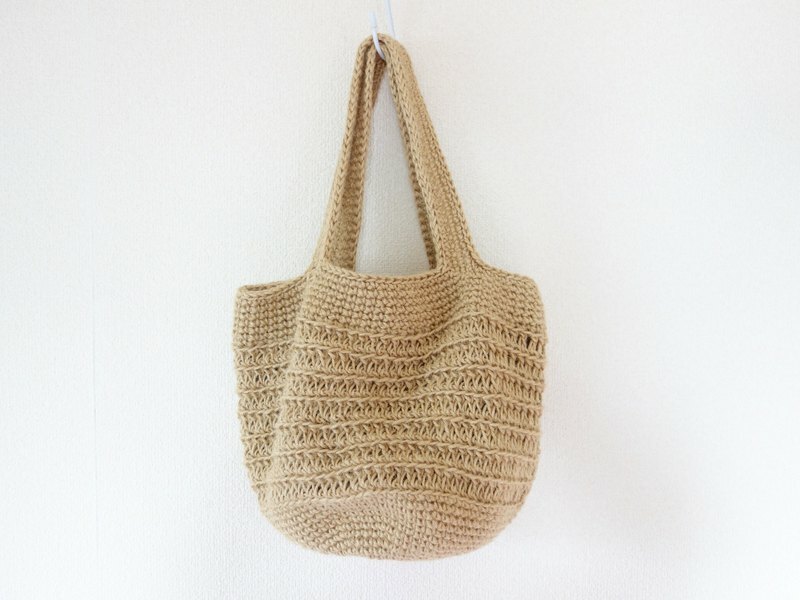 It is a shoulder bag knitted with linen cord. The bottom is round, and the pattern knitting on the side is accented. "Simple, durable and beautiful" It is a perfect design for this shop concept. It has an inner cloth. Pocket is not attached. // material // Main body jute 100% string Inner fabric linen 100% cloth //size// Circle with bottom of about 20 cm Height (not including hands) Approximately 23 cm Length of possession about 52 cm ※ Because it is handmade one by one, a slight error occurs in the finished size. // Care instructions // Please wipe with a cloth squeezed hard when it gets dirty. ※ Hemp fibers are attached to clothes. Although it will be unnecessary while using it, please be careful when matching with black clothes.